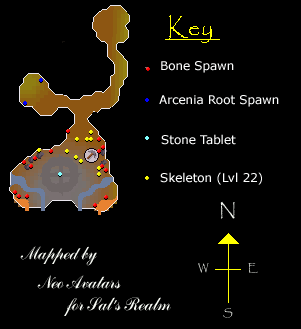 If you are looking for the modern RuneScape guide for this content, please see our The Dig Site guide. Speak to an examiner at the digsite Exam Center. 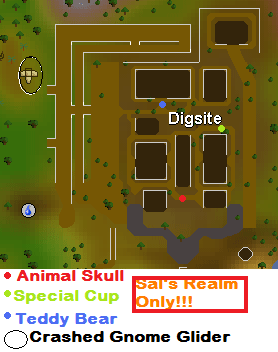 First off, head to the Digsite Exam Centre by taking the east road out of Varrock and following it south. Go through the gate and follow the road east until you reach the Exam Centre. Talk to an Examiner, ask if you can be examined, and she'll give you can Unstamped Letter. 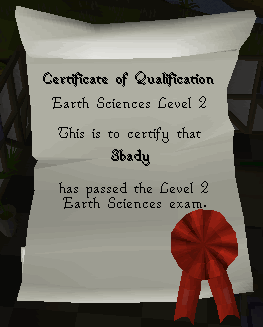 Bring this to the Curator of the Varrock Museum and use it with him to get a Stamped Letter . Now go back to the Examiner and try to take the test. No matter what answers you choose, she will say that they're wrong. It looks like you need some help with the exam, and the students down in the Digsite may be able to help. Animal Skull - You can steal this one from any of the Digsite Workmen. If you fail, you will be hit for damage depending on your defense level. Special Cup - Head to the southeast corner of the Digsite and pick up a Panning Tray from inside the tent. Use it with one of the Panning Spots in the river to get stopped by a workman. Ask him how you can be invited and he says that he wants some Tea, which can be Thieved from a Tea Stall southeast of the Varrock east bank, or taken from the counter near the same stall. Use the tea with the guide and he'll let you pan in the river for the Sample. Teddy Bear - Just outside of the site, near the ramp you came in from the south is an Urn, surrounded by bushes. Search them to find the last sample. 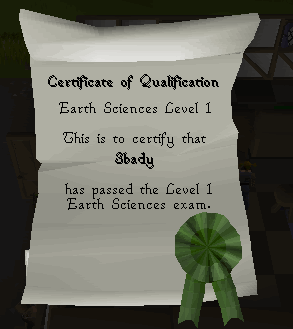 Earth science is the study of earth, contents and its history. Gloves and boots must be worn, and the proper tools used. Anyone who has passed earth science exams are eligible to dig. Now go back to the Examiner and take the test again. When you pass, she'll give you a Level 1 Certificate. Go back to the students and get the answers for the next exam. Rockpick Usage: Handle with care, strike the rock cleanly on the cleaving point. Finds must be carefully handled and gloves must be worn. Sample Transportation: Taken in rough form, kept in a sealed container. With the next set of answers, head back to the examiner to take the test and get another certificate. Again, go back to the students to get the last set of answers. When you ask the girl, she'll want an Opal. Go back to the river in the southeast corner and use the Panning Tray until you get 1. Specimen Brush Use: Carefully and slowly, short strokes. Sample Preparation: Cleaned and carried in Specimen Jars. Handle bones carefully, keep away from other samples. Take the last test and when you finally have the last certificate, bring them all back to the Curator of the museum. Use each one with him and he'll give you a reward of either a Chocolate Cake or Fruit Blast after handing him the last one. Now head back to the Digsite and search the sacks in the northeast corner near a winch for a Specimen Jar . Pickpocket a Digsite Workman for a Specimen Brush, and then dig in any of the level 3 dig areas with the Trowel that the Examiner gave to you. There's one in the Northeast corner, as well as near the west wall of the Digsite. 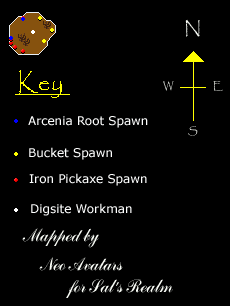 Use the Trowel with the dirt until you find a Talisman of Zaros. Bring this the the Archaeological Expert in the Exam Centre and use it with him. He'll give you an invitation to dig in the shafts. Take an Arcenia Root from the ground, and then search the rocks. Then climb back up to the surface. Talk to Doug Deeping, the Workman, and ask him about moving the rocks that are in your way. He will give you a chest key. Now go back to the southeast corner to the large tent and use the key with the chest to find some Chemical Powder . Search the nearby Specimen Tray until you find some Charcoal, and then ground it up with a Pestle and Mortar. Use your Trowel with the barrels next to the tent, and then use a Vial with it to fill it with Undefined Liquid. Bring these all back to the Expert in the Exam Centre, and use the powder (Ammonium Nitrate) and then the liquid (Nitroglycerin) with him. Use the Nitrate with the Nitroglycerin, add the Ground Charcoal and then the root to get a Chemical Compound. Once you've mixed everything together, speak to the Expert again. Go back to the Digsite and operate the west winch, and then head a short distance east until you come across some large bricks blocking the path. Search them, and then use the Chemical Compound with them. Now just use your Tinderbox with the bricks to cause an explosion and clear the path. Go inside and take the Stone Tablet from the altar back to the Expert to complete the quest.